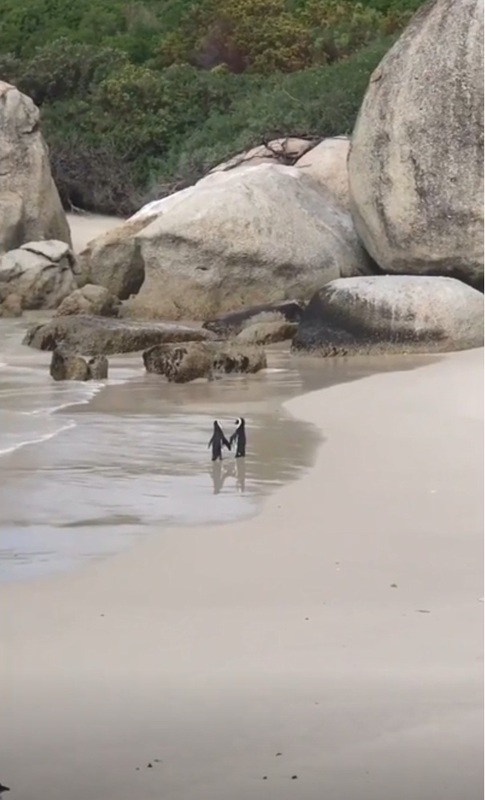 This African penguin couple romantically strolling on the beach, flipper-in-flipper, might just restore your faith in love. 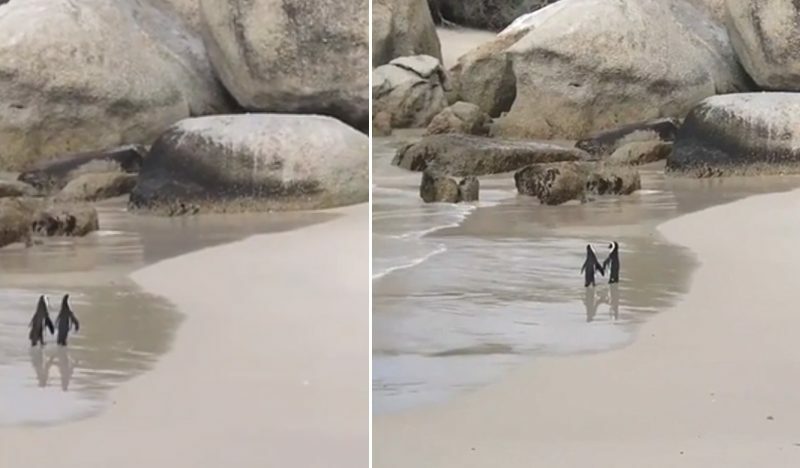 A viral video posted by Storytrender shows two penguins out on the beach, strolling while holding each other’s flippers just like human couples holding hands. Norma Landeros-Ramirez was celebrating honeymoon with her husband in Cape Town, South Africa when the heart melting scene unfolded right in front of her eyes at Boulders Penguin Colony. She was lucky enough to record the lovely sight with her smartphone. She saw a pair of penguins waddled out of the sea and walked along the coast together, flipper to flipper, like a couple deeply in love with each other. 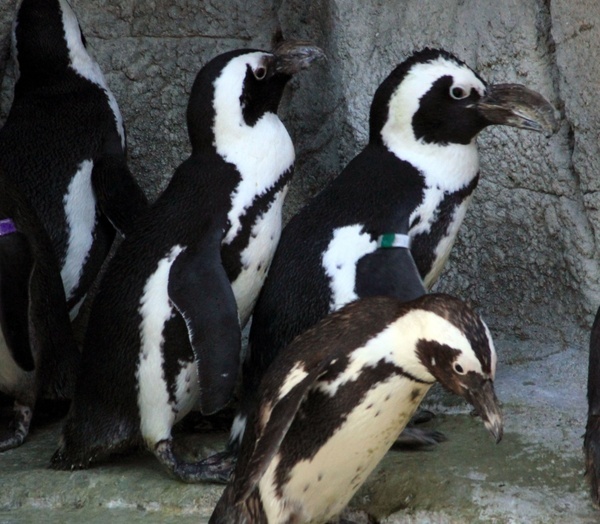 Norma tells Storytrender: "Since my husband and I are newlyweds, I wanted to see the penguins because I have heard that they keep one partner for life, so it seemed fitting." As a matter of fact, a lot of penguin species are monogamous. Meaning to say, they have the same mates for their whole lives. When they first meet, they do an adorable dance together in which they tap their feet as close to each other as possible and make squeaky noises. They're faithful to one another until de@th do they part. As of today, this viral video has racked up 166,000 views on YouTube. Some netizens wonder what penguins are doing in South Africa. Contrary to popular belief, penguins don't just live in the Arctic. They also inhabit a lot of different countries. In Africa, they have their own breed of penguins which can be found on the southwest coast, living in colonies on 24 islands between Namibia and Algoa Bay, near Port Elizabeth. African penguins are also known as jackass penguins or the black-footed penguins. They got the name jackass for their donkey-like brays. They are accustomed to warmer climates. "Nice video. So nice to see happy things like this. Penguins are full of happiness and love. They feel love just like us humans do only I think they respect each other more than humans do." Some netizens are even jealous. Lovely Vee says: "These penguins got a better love life than me!"